Description: Individually numbered limited edition! Only 2000 copies! 180-gram audiophile all-analog pressing double LP! Miles Davis' two night stand at The Blackhawk in San Francisco marked a watershed in jazz history, a seminal event transforming the American musical landscape. Davis had never been recorded live in a club with his combo and the performances over the course of two sets a night on April 21 and 22, 1961 more than justify the legend. The New York Times, in its review of the Columbia Records release of the complete Blackhawk shows, called the music "the gold standard for straight-ahead, postwar jazz rhythm". Impex Records is proud to present a performance unequaled, a recording unparalleled and the must-have audiophile release of this or any other year. Strictly limited to 2000 pressings, so get yours now before they're gone! 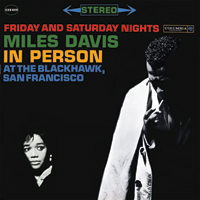 "Friday and Saturday Nights in Person at The Blackhawk, San Francisco, everyone's second favorite small club live engagement (the first being Bill Evans at The Village Vanguard) finally gets the AAA 180g vinyl treatment with this double LP set from IMPEX... this is a superb sounding reissue that every Miles fan should own. It's as close to hearing Miles Davis play live in a small club as you're ever going to hear." Recorded live at The Blackhawk, San Francisco, on April 21 and 22, 1961. Originally released as C2S820 by Columbia. This limited edition vinyl reissue released by Impex Records in 2012.